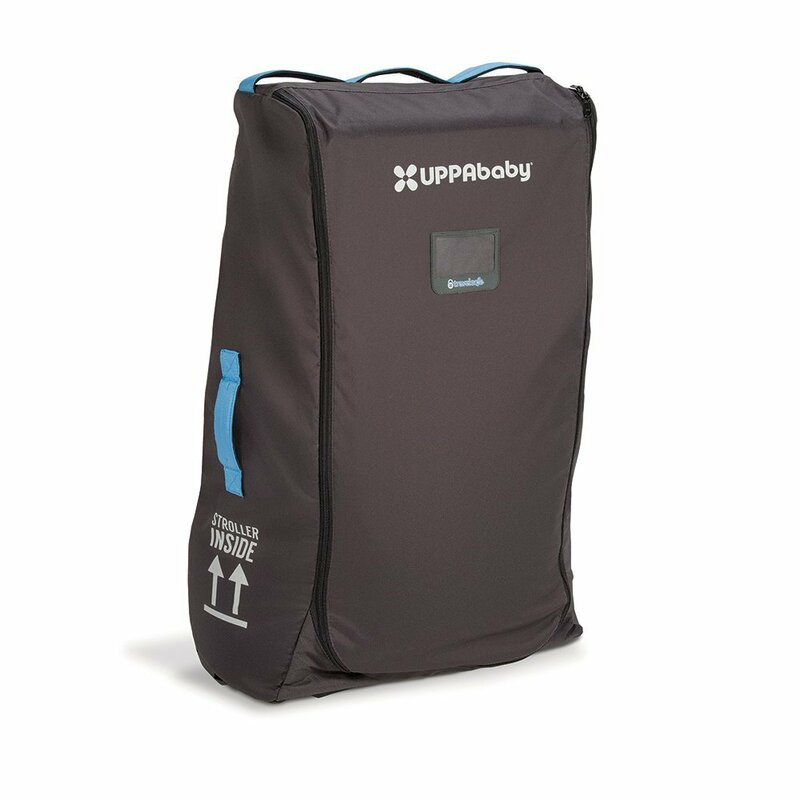 UppaBaby Vista (0227) is a solid and durable nylon travel bag that is designed for use in air and other modes of travels. It scores 4.3/5 stars out of 105 reviews at the time of the review on this page, indicating generally very happy customers. 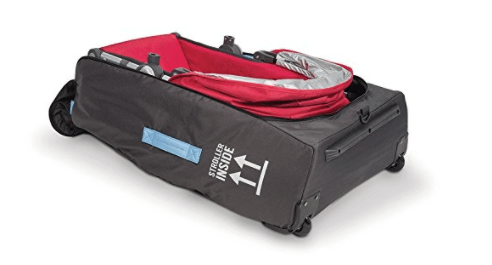 The travel bag weighs 5.5 pounds, measures 23.2 x 11 x 6.5 inches and is spacious inside- you can fit in stroller frame and a bassinet or stroller frame and toddler seat. A standard seat will fit in easily if you place it front facing and fold the stroller. It includes a luggage tag pocket at the front where you can put your name and contact details in case it gets lost. With the two exposed transport wheels at the bottom, you can roll it comfortably on different grounds. There are warning signs on both sides of the bag to let the airport staff know there is stroller – pushchair inside so they can be more careful. And in case of any damage by airline staff, Uppababy will take care of it as long as within the warranty period. With the TravelSafe program you just register your travel bag and stroller online before departure and if any damage is done to the pushchair during your travel it will be fully covered. The five-digit serial number is inside the bag next to the top handle. You need to take off the stroller wheels to use this and you’ll find a wheel bag inside with padded bumper bar pocket that is attached to the side and can’t be detached. It is a good idea to not remove it from the travel bag anyway in case you lose it. It is quite a good quality bag and seems to protect the stroller over many travels despite the rough treatment by the airline staff. You don’t have to worry even if anything happens to the stroller anyway. UppaBaby Vista stroller fits very easily in this bag and you can put in a couple of other items like baby clothes or blankets in there. It is not a cheap bag and a lot of you may be put off by the higher price tag. But judging by the many customer reviews by customers that took many travels with this bag it seems to be very well worth the price, especially considering the generous air travel warranty for the bag and the stroller. It may be a little hard to get some strollers into this bag at first but gets much easier with trial and error, also with the bag stretching a little. Please note that the bag is not waterproof but is made of a solid fabric that dries fast and generally speaking you shouldn’t have any problems. You can check it in as luggage at the airport and you may even check it in for free with some airlines like Delta. Overall it is a very good quality product with a fair price tag, especially for the great warranty company offers for the bag and your stroller.